Ladakh is the third region of Jammu and Kashmir State. Each of the regions, Jammu, Kashmir and Ladakh have distinct ethnic types, geographical terrains, religious and life style. 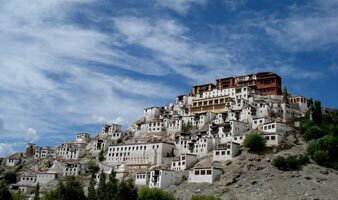 Ladakh, in the Himalayan watershed, is a high-altitude desert, its lowest point at 9000 feet above sea level, unsurprising for a land that lies locked between the Himalayas, Ladakh and Zanskar ranges. Ladakh is a land like no other. Apart from Great Himalaya it is bounded by one more mighty mountain ranges of world i. e. KARAKORAM. Formed only a few years ago by the buckling and folding of the earth’s crust as the Indian sub-continent pushed with irresistible force against the immovable mass of Asia.Ladakh lies at altitudes ranging from 2750 m (9000 ft) at Kargil in the west to over 7600 m (25000 ft) in the Karakoram range. Leh is the main town of the region. Centuries ago this was an important stop on the old caravan silk route from China. Today it’s merely a military base and tourist centre, but wandering the winding back streets of the town is still fascinating. It’s about 10 km north east of the Indus river in a fertile side valley. 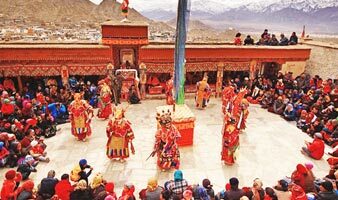 This festival showcases the best in Ladakhi culture and traditional sports like archery and polo. Admission to all events is free. The polo grounds within Leh is the hub of most activities. The inauguration ceremony is a must see. Colourful processions start the parade. Contingents in their traditional costumes come from every part of the district. Some contingents represent particular arts (theatre for instance), rather than regions. The inaugural show at the polo ground is virtually an abridged version of the entire festival. Lying at height of 3600 metres in the lower part of the big valley of Stok, was built in the beginning of the 19th century. 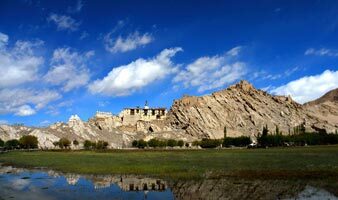 It is the residence of the Rani of Stok – the queen of Ladakh. The palace is now converted into a museum, where exquisite collections of the royal family is displayed. Stok was the Palace of the banished royal family. This is the only inhabited palace in Ladakh. A museum in the palace displays fabulous period costumes and jewellery of the royalty. Interesting historical objects like coins, seals, armour, weapons, precious jade and porcelain can also be found on display. The palace is about 200 years old. Close to Leh airport, this monastery is about 1000 year old. It has three chapels, from the highest, perched on the top of a hill, there are superb views over the Indus valley. One of the lower chapels has some very fine (new) wall paintings. There are fine tankas and silver Chortens and a statue of Kali, the face of which is only shown once a year. Spituk stands on top of a hillock overlooking the Indus valley. This 15th century monastery houses a collection of ancient masks, antique arms, and an awe-inspiring image of Kali. The face of the Kali image is kept covered and revealed only at the annual function in January every two years. A small gompa with only 20 monks, about 02 kilometres from Leh, is a subsidiary monastery of Spituk. There is a fine painted mandala and a statue of Chanrazik with 1000 arms and 1000 hands and an eye on each hand.The Shankar Gompa (monastery) is famous for its numerous statues of pure gold and a number of interesting paintings. Close by are the Leh Palace and the cottage industries emporium. Once the summer palace of the kings of Ladakh, it gives the appearance of being built around and a huge golden figure of Buddha 40 ft high, which was made in the 17th century. The upper chapel is balcony around then head of Buddha, while the lower chapel has an extensive library and some tankas.Shey, was once the residence of the royal family and is famous for its gilded statue of Buddha that stands at a height of 7.5 meters. A visit to this monastery, however, needs prior permission from the Lama. One of the largest religious communities of Ladakh lives here. 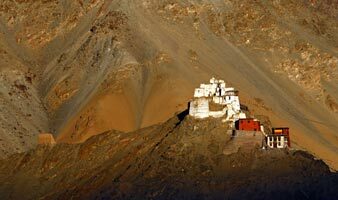 The gompa seems to grow out of a hill above the Indus and looks like a miniature of the Potala in Lhasa. It has particularly fine library of hand painted manuscripts and block printed books, and some mandalas on the walls. Both Shey and Thikse have an oracle-a lay person who is invaded by a spirit and travels around the valley making prophecies.A fine example of Ladakhi architecture, Thiksey is one of the largest and most impressive gompas. There are several temples in this gompa containing images, stupas and exquisite wall paintings. It also houses a two - storeyed statue of Buddha which has the main prayer hall around its shoulder. This monastery has an outstanding collection of art in its chambers. 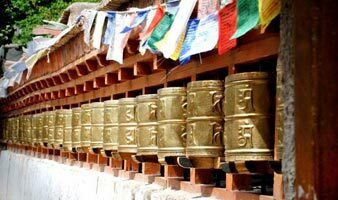 The most famous and perhaps the most important of all the monasteries in Ladakh every year, it is the scene of a great festival to which Buddhists come from all parts of the sub-continent. It also contains some of the finest art treasures in Ladakh, including a giant tanka which is only displayed every 12 years. 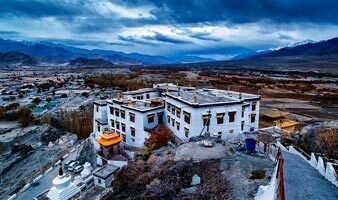 Hemis is the seat of the Rimpoche, a spiritual lord who is head of the Drugpa Kargyupa, one of the divisions of the red hat sect he is a reincarnation of the 17th century founder of Hemis Stagtshang Raspa. 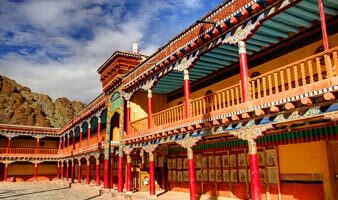 Hemis is one of the richest, biggest and most famous monasteries in Ladakh. Its popularity stems from the major annual festival held during summer in honour of their Guru Padma Sambhava's birth anniversary. It was built during the 1630s. Of its many frescoes, the most famous is the Wheel of Life. 70 Kms from Leh on banks of the Indus, is Alchi Gompa dating back a thousand years. One of its walls features thousands of miniature-sized pictures of the Buddha. Three large sized images made of clay and painted brightly are its focal attraction. This monastery consists of six temples, with seated statues of Buddha and exquisite paintings. Its exquisitely painted walls depict the events of the Buddha's life, lamas and musicians. Desolate moonscapes and wastelands, a bastion of the arts and a unique lifestyle. The 434 km drive from Srinagar to Leh takes 2 days and the flight about 40 minutes. The road journey is preferable for many reasons. The drive passes through an extraordinary range of scenery and crosses three major passes: Zoji La at 3529 meters, Namika La 3718 meters and Fatu La at 4092 meters. The landscape changes from the fertile green valleys and forest hillsides of Kashmir to the bare hillsides of Central Asia . The two days drive also allows the body to acclimatize to the change of altitude. The road climbs over Zoji La pass, 110 km from Srinagar . The first is the village Drass (one of the coldest inhabited places in the world in winter). The road then drops slightly to the district of Kargil at 2650 meters. Once a trading town on the ancient caravan route, it is a night halt on the road to Ladakh (lot of hotels available). The village of Shergol has a small gompa (monastery) but the town of Mulbekh is more often thought of as the Gateway to Ladakh. A little beyond Mulbekh is a huge rock carving of Maitreya, the Buddha of the future that towers over the road. After crossing Namika La and Fatu La passes the road looks down on the incredible Lamayuru gompa perched on the opposite hillside, with a village at its base. The first monastery was built on this site in the 10th century and a part of the central building serves as home to about 30 lamas (monks). After Lamayuru the road joins the Indus valley at Khalste and follows the river upstream to Leh. There are numerous places of interest en route but the 11th century Alchi gompa, a few kilometers south of Saspol (70 km west of Leh) is among the most important. The temple wall paintings and frescos are among the most beautiful and best preserved examples of Ladakhi Buddhist art . Most of the paintings in monasteries show the stages of the Buddha's life, royal personage, figures of various Bodhisattvas and Tantric deities. 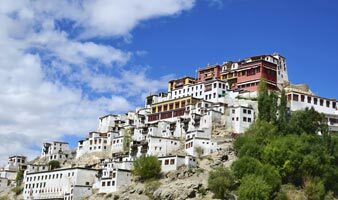 Leh was long an important stopover on the ancient routes between Kashgar , Tibet , Kashmir and the Indian plains. The 16th century deserted and damaged palace on the slopes of Namgyal Tsemo hill rises above the town. The view south from the roof across the Indus valley and towards the Zanskar Mountains is worth the climb.. Leh is the most convenient place from which you can explore many interesting monasteries and gompas. We have started offering some fascinating treks in Ladakh; let us know your interest and we will organise a special tour for you.